World leading researchers at Glyndwr University’s OpTIC Technology Centre, St Asaph are celebrating a double award success for their work on two major telescope projects. The Glyndwr Innovations Ltd team picked up the Research and Development award and the New Product Award at Insider’s Business and Education Partnership Awards 2017. Glyndwr Innovations’, Precision Optical Systems Group based at the St Asaph site have been collaborating with Liverpool and Durham Universities to develop technology for fabrication of low-cost mirror segments for the Cherenkov Telescope Array (CTA). With more than 100 telescopes located in the northern and southern hemispheres, CTA will be the world’s largest and most sensitive high-energy gamma-ray observatory once completed. Glyndwr Innovations Ltd.’s Involvement in the CTA project secured the R & D award for the group. 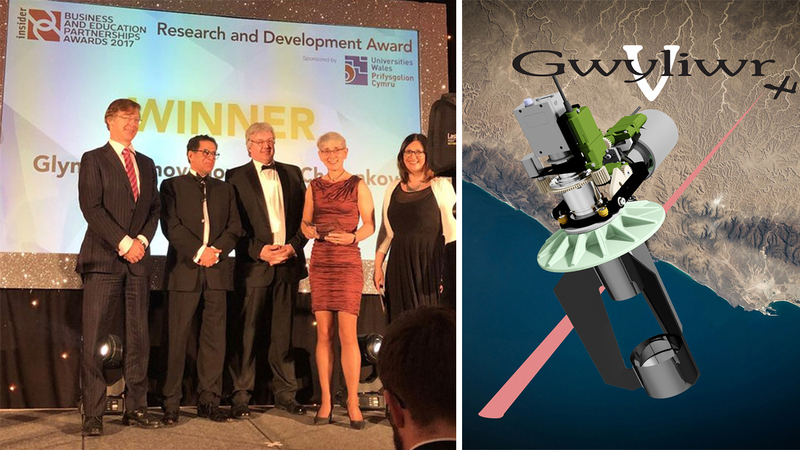 In addition to this award the team also collected the New Product Award, Glyndwr Innovations impressed the judging panel with its ultra-lightweight, high resolution telescope for ground imaging applications. “Gwyliwr”, as the final telescope product is known, is designed to be mounted on a HAPS (High Altitude Pseudo Satellite) platform to deliver high resolution images from high altitudes. The system was developed as part of a Centre for Defence Enterprise (CDE) funded project. CDE is a group based within DSTL. Caroline Gray, director of the OpTIC Centre, said: “To win not just one but two awards is a massive achievement for the Precision Optical Systems Team and for Glyndwr Innovations. The awards are the result of a tremendous amount of hard work by everyone connected with the projects and the OpTIC Centre. Led by Wales Business Insider magazine, Insider’s Business and Education Partnerships Awards 2017 is a unique awards ceremony to celebrate collaborative work between universities, colleges and companies in Wales. The awards ceremony was held at Cardiff Marriott Hotel on Thursday 2 November 2017. The OpTIC Technology Centre is a hub for high-level technology businesses and scientific innovation, comprising of Optical and Opto-mechanical design, manufacture, test and assembly services which work to support the extensive business incubation units and conferencing facilities.